A friend of mine (a mom I met at a GOV event) has a dear 12 year old boy who stole my heart the first time I met him. He has dimples when he smiles, is rarely at a loss for something funny to say, cannot contain his energy, and genuinely cares for other people. I am convinced he is going to grow up to be a mighty man of God. But a while back he told me he was being bullied at school and that all of his friends tease him constantly. I watched the pain flicker across his face when he admitted this to me. I think the reason it’s so painful for him is because, like I mentioned, he is a genuinely caring person who makes an effort to help other people feel comfortable. He’s not perfect, but the fact that other kids could go out of their way to make him feel bad is probably baffling to him. What Ephesians 6:12 says should comfort us. 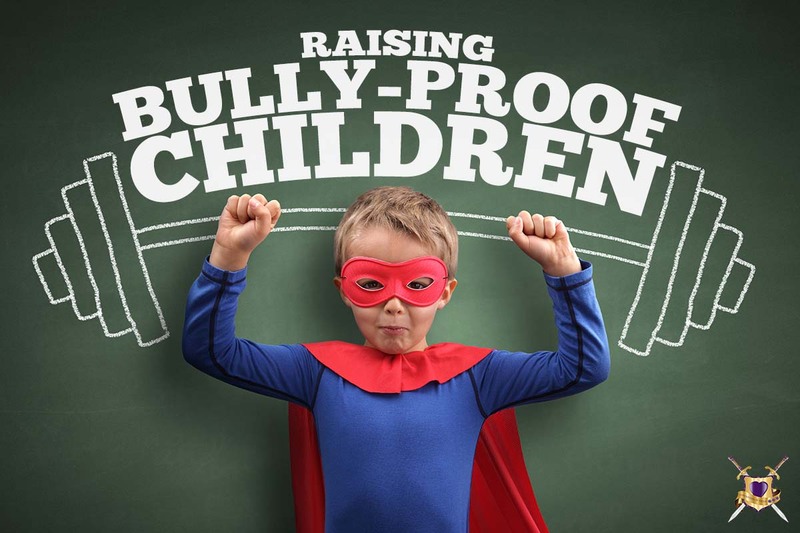 Because the good news is, mom and dad, there is a lot you can do in the spiritual realm to help your child affected by a bully. This is where you can roll your sleeves up and DO something. I’d like to propose a tactic parents can use to respond in the opposite spirit of bullying. It’s so simple you can do it with your child before he or she leaves for school or meets the bully at the playground. You ready for it? It’s speaking and praying words of blessing over your kids. It sounds simple, right? Yet it can have a profound effect. If kids know the truth about who they are in Christ, they won’t believe the lies other people say (implicitly or explicitly) about them. They won’t listen to Jill or Jimmy when they say things like “You’re stupid” or assume they are unworthy of friendship when they’re given the cold shoulder on the playground. Instead, they’ll remember the scriptures you read about them and who they are. They’ll remember your words of blessing spoken in love, and they’ll choose to believe those words instead of the negative ones coming from their peers. Here is a list of scriptures to get you started. For more ideas an practical tips for blessing your kids, please check out Project Blessing. I think you’ll find incorporating scripture into your prayers for your children gets easier the more you practice. My suggestion is to pick a few key verses that speak most specifically to your child’s situation and start by praying those over him or her. Click here for the printable version of this prayer and the verses. It’s quick, it’s simple, and it is guaranteed to have a positive effect (Isaiah 55:11). It’s a good idea to let your child read these scriptures (or read them to him/her) if they tell you of a bullying problem. Having your child read the scripture will show him or her that the things you are asking for in Jesus’ name are things we are instructed to ask for. It will also build their faith in God and help them to see how the Bible applies to our daily lives. Another idea is to pray for God’s protection over your child while he or she is at school. Perhaps you know the hour your son or daughter shares a class with the bully. You could set an alarm to remind yourself to pray during this time. Another idea is to leave hand-written notes to your child in places where he or she will find them at school, like inside a pencil box, lunch bag, notebook, etc. These notes could include some of the scripture you prayed over him or her before leaving for school. They could also be quick notes of encouragement that say things like “Mom loves you!” “You are my favorite 8 year old!” “I can’t wait to see you when I get home!” “I hope you’re having a good day. I love you!”. My mom did this for me when I was going to school. What a bright note those were in the middle of an otherwise mundane or hard day! The bottom line, mom and dad, is you want to counteract the negative messages your kids are receiving with positive messages. And if those positive messages come from scripture, they will have even more punch. May the Lord equip you as you undergo this spiritual battle. Many times we think that the decisions we make will only affect us. This is clearly not true. God states specifically here that our actions will have ramifications for generations to come, whether good or bad. The scary part of this is that your children’s children could potentially reap the negative consequences of your poor choices. However, the good news is that you can pave the way for your descendants before they’re even born by establishing healthy patterns in life and choosing to honor God in EVERYTHING you do. It is scientifically proven that your thought processes affect what is encoded into your DNA and thus passed on to your children. Parents have an enormous responsibility to establish a pure foundation for their children to grow on and learn from. Eventually your children will build their own foundations, and then they will have the opportunity to change the mix up a bit, but they will still resemble the character traits you are developing in yourself even right now. If you keep your focus on God, and teach your children to do the same, you will be exponentially impacting your family for the coming generations by keeping the commandments of God. Everything you do right now makes a difference in the future of your family, and consequently in the future of this world. A resource we have found to be incredibly helpful for dads seeking to pass on an example of purity to their children is Preparing Your Son for Every Man’s Battle by Fred Stoeker. For parents of girls, we recommend Beautifully Made! by Julie Hiramine. Passport 2 Purity by Dennis and Barbara Rainey is also awesome for girls and boys. Plus, it has a refill pack for multiple children.